WordPress and open blogging platforms in general have been increasingly adopted in teaching and learning in Higher Education. UBC Blogs has over 10,000 active blogs used by Faculty, Staff and Students as community sites, course blogs and for personal reflection and publication. Join us for an interactive and hands-on exploration of the WordPress platform in teaching and learning. Explore examples of how WordPress has been used for teaching and learning at UBC including: a classroom backchannel, a way to engage and sustain communities, a reflective space for learning and assessment, a course blog where students can share media, interact and discuss course topics and materials, an open space where students can engage with an interact with a global audience on the Web. The session will include a hands-on-component that will introduce you to the overall set up of a WordPress site and provide you with the tools needed to go further. This is an introductory workshop open to anyone with an interest in the WordPress/UBC Blogs platform or interested in the role of open and social media in the classroom in general. Before you come to the session, you should sign-up for a UBC Blogs account and create your first blog. Burning Questions: What burning questions do you have about WordPress that you would like to learn the answer to during this session. A page is on a topic and there is one page on that topic. A user views pages one at a time. A post is like a collection of pages. A post belongs to a category. A site has multiple posts about each category. In my site, I have a category called “Articles.” As I post an article, I categorize it under Articles. This enables a viewer to see my articles by clicking on the category “Articles.” A user can view a single or multiple posts at a time. A post is time sensitive, reflecting when it was written with the most recent shown first. The more website-like a blog is, the more posts it will have. Pages are website-like, posts are blog-like. 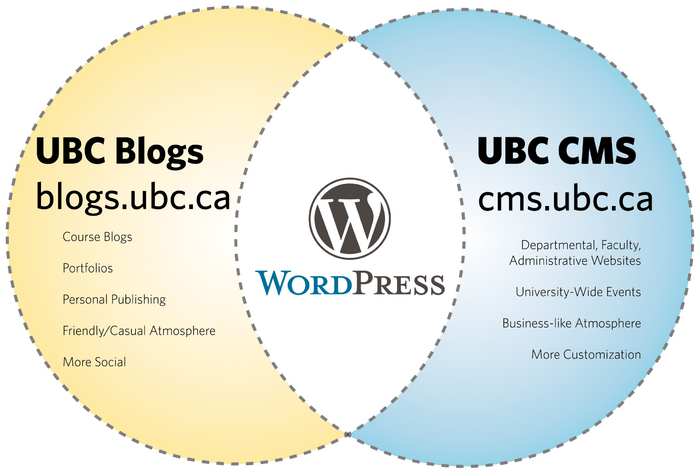 UBC Blogs and CMS at UBC both run the open-source WordPress blogging platform. 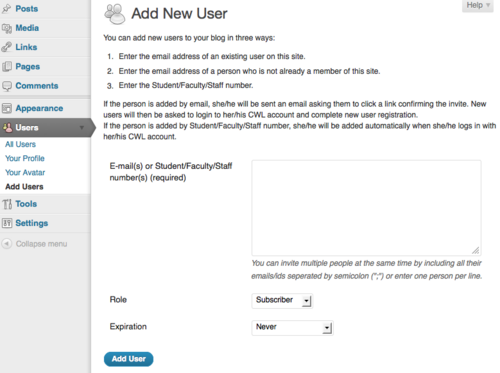 UBC Blogs is integrated with the Campus-Wide Login (CWL) system. You don't need to create a new ID, just sign-up with your CWL. 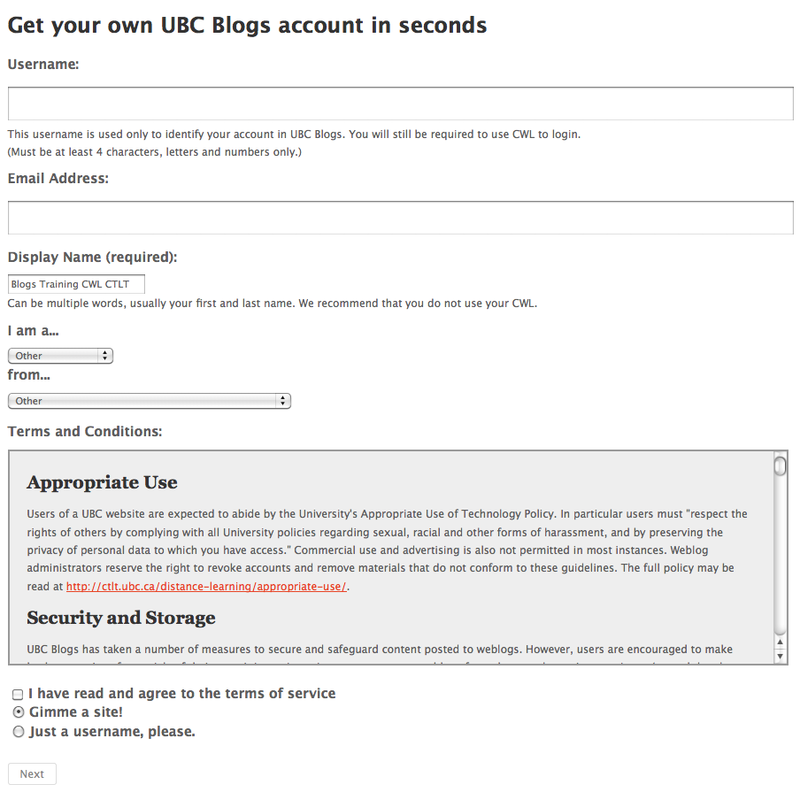 This also means that UBC Blogs is available to any member of the UBC community. 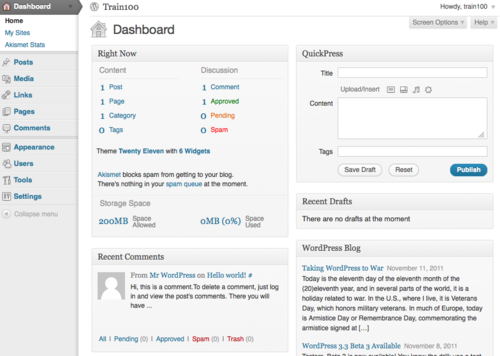 The Dashboard is the "nerve" centre of your blog spaces. 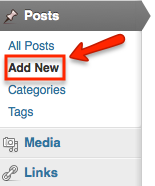 This is where you can create posts and pages, upload files, manage comments, and change the settings of your blog. Familiarize yourself with the Dashboard as you will be spending lots of time on it. Found on the top-right corner of your screen, the Screen Options menu allows you to customize the look and feel of your dashboard. It controls the visibility of certain areas (e.g. Right Now and Recent Comments in the Dashboard Home) or the visibility of information in certain pages (e.g. the Author or Date column in the Media Library). Check the Screen Options menu first if you cannot find a particular item in your the Dashboard. The Screen Options menu can be found at the top-right corner of your screen. 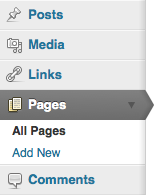 WordPress employs two fundamental content types: pages and posts. These content types behave quite differently and therefore it is important to understand when to create a page or a post. Pages are static. They are a good way to publish information that doesn’t change much, like an "About" or "Contact Us" page. Pages are usually linked from the main navigation bar on the Homepage. Posts are dynamic. Posts are always associated with a date and are meant to update your audience. Posts are designed for more dynamic content such as news and updates. Published new posts will appear immediately on your website. 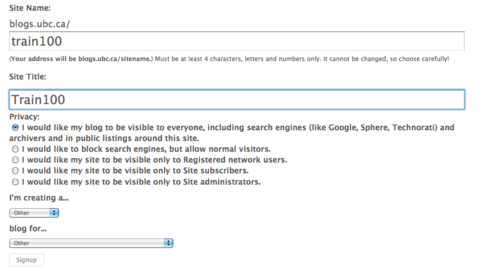 Categories and tags are indexing systems for your site. Categories are typically used to index your posts often using general taxonomies. Tags are typically more granular than categories and are often used to link to keywords or details within a posts. Once you have published your posts it will be linked to this category. Categories and Tags can be added to while writing or editing a post. Pages are used for static information in WordPress. To access all of your site's pages click on All Pages. From this list you can edit and delete any of your pages. The following steps will guide you through adding pages to your site. 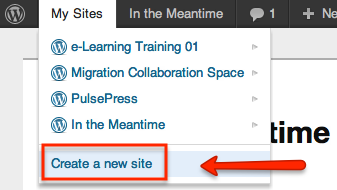 To create new pages, click on Add New under the Pages section of the Dashboard sidebar. The Reading Settings control how a webspace is displayed to visitors. Front page displays allows you to choose what appears on the blog’s front: the latest posts or a static page that you have created in the Pages section of your blog. 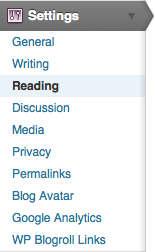 The Reading Settings can be found under Settings on the Dashboard sidebar. A number of different media formats can be uploaded to WordPress MU including PDFs, Docs, PPTs, and images. This media can be inserted into pages and posts in your site. The following guide will assist you in adding content to your site. 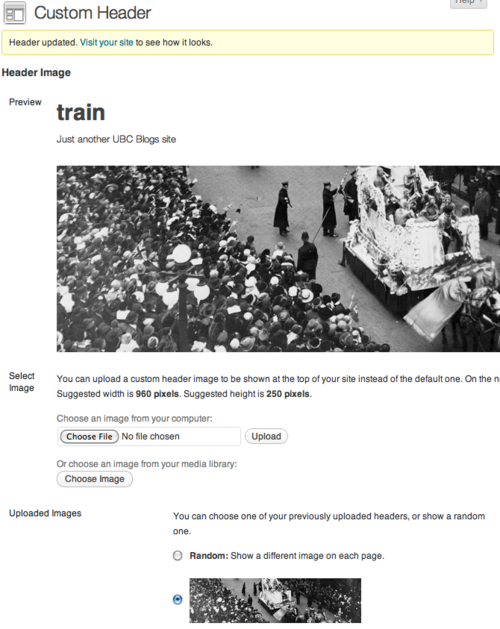 Add files to your post/page via the Upload/Insert Media above your Formatting Menu. The Web is full of rich and diverse content such as photos, videos and music. One of the primary characteristics of the modern web is the ability to easily share media with others. Sharing can be facilitated by embedding or placing resources such as photos and videos into your pages or blog posts. Look out for the </Embed> or Grab Code links or buttons on websites such as Flickr or YouTube. You only need to copy the HTML code they provide and paste into a post or page while in HTML View. Ask permission from the creator, include where you are from and what you are using the content for. WordPress Widgets are designed to provide a simple way to add various elements to your sidebar or footer without changing any code. They can help visitors easily navigate through your site or find the specific information they need. Take note though that widget areas are theme dependent. Not all themes will have the same places to put widgets in. This box contains all the available widgets you can use for your blog. 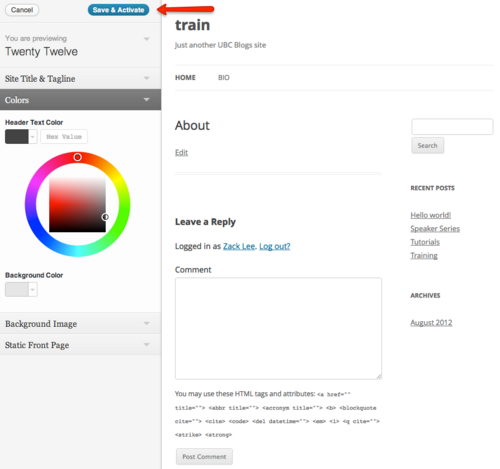 Depending on your blog's theme, you can have different areas to add widgets to. Some areas are for your left sidebar or the right sidebar. There are also themes that allow you to add widgets to your blog's footer. You can archive widgets you have used by placing them in this box. All the widgets placed here will retain all their settings, ready to be used if you choose to do so. When you change themes, all of your widgets will not be transferred automatically but placed in the Inactive Widgets area. You can add widgets by simply dragging a widget from the Available Widgets box and dropping them into any of the Widget Areas. Remove widgets by dragging them outside of the Widget Areas or dropping them into the Inactive Widgets box. You can add widgets that will help visitors navigate around your site. Depending on how your structured your content, you have a number of options at your disposal. 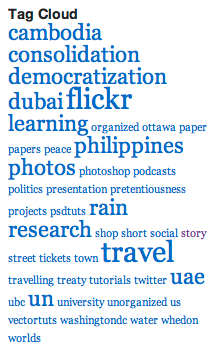 Tag Cloud Widget: Creates a text cloud based on the tags you have used on your posts. The more a tag is used, the larger it will appear in the tag cloud. 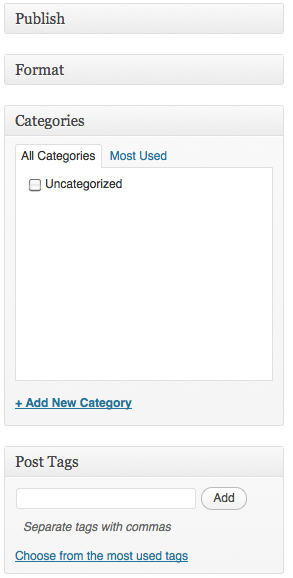 Categories Widget: Create a list based on how you categorized your posts. You can also create drop-down menus by using subcategories. Pages Widget: Creates a list based on the pages you have created. The Text Widget provides you added flexibility with an area to add custom text, images, or any other media onto your sidebar. Some knowledge of HTML is needed for more advanced and customized uses. If you don't know HTML, try creating your content as a post and then copying the code in HTML View. Take note that space for the sidebar area is limited. You may need to adjust or experiment a few times to get the sizing correctly. WordPress Themes can provide control over the look and presentation of the material on your webspace. Changing your WordPress Theme does not impact the content of your site only the look and feel (e.g. header image, widgets). 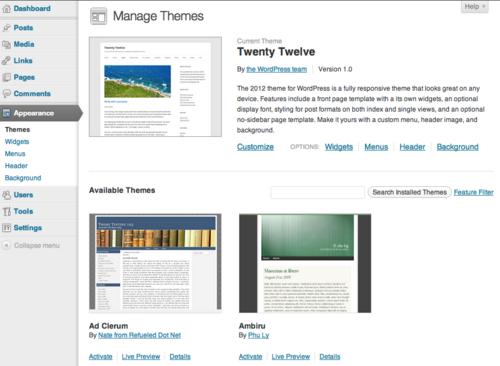 From the Dashboard, under the Appearance drop-down menu, click Themes. Manage Themes screen appears, displaying your current theme together with the different customization options. Browse through the many different themes. In the Live Preview page, you can customize your site using the different options on the left-hand sidebar. Note: Options in Live Preview are dependent on the theme's features. Feel free to experiment as this will not appear on your site until you click Save & Activate at the top-left corner of the page. Click Save & Activate at the top-left corner of the screen and visit your site. Live Preview empowers you to change your theme's settings before it appears on your site. Save & Activate is at the top-left corner of the screen. Some themes enable you to add customizable headers for greater personalization of your webspace. Remember that all themes are different; some might not even have headers. Not all themes have custom Headers or even any header at all. The WordPress Users feature is designed to give the blog owner the ability to control and assign what users can and cannot do in the blog. A blog owner must manage and allow access to such functions as writing and editing Posts, creating Pages, defining Links, creating Categories, moderating Comments, managing Plugins, managing Themes, and managing other users. You can add as many administrators, subscribers, editors, authors, and contributors to your blog as your like. You have the option of creating a second (even third!) webspace for yourself/department/faculty. 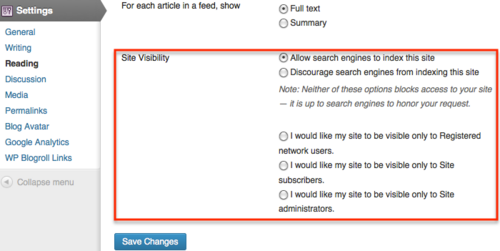 From the My Blogs drop down menu at the top of the screen, click Create a Blog. 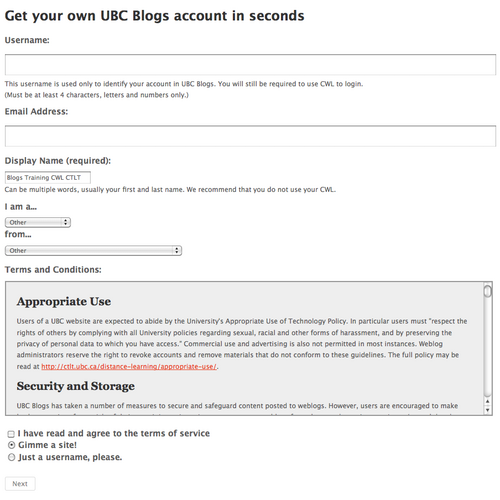 The "Get another UBC Blogs site in seconds"" appears. 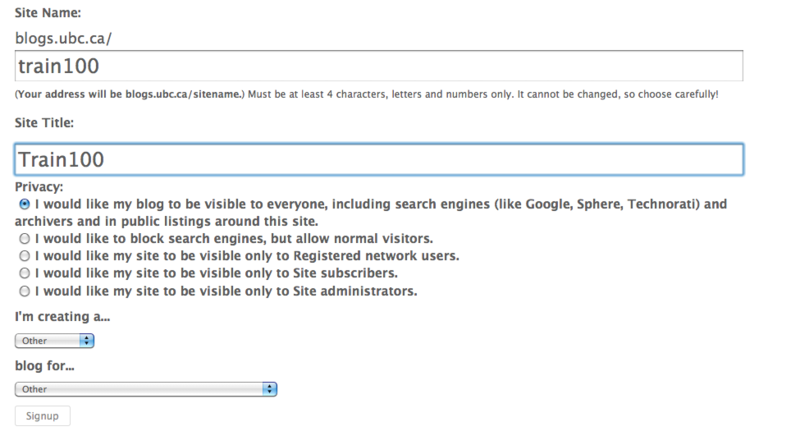 Complete the required fields and click the Create Site button at the bottom of the page. Under My Blogs is the Create a Blog! link. This page was last edited on 15 February 2018, at 18:51.